About Us - Amarjit Directory Publishing Co. Pvt. 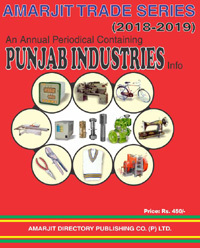 Ltd.
Amarjit Directory Publishing Co. Pvt. Ltd. established in the year 1987, is a premier company of India engaged in Publication of Industrial Directories and Books for Business People. The company is very popular in India as well as abroad for the authenticity of its publications. The Company collects data through scientific methods and a lot of field work is involved in getting the authentic information from the concerned business community. Throughout the year, our staff is working very hard by visiting the business houses personally, thereby enabling to compile the information user friendly. The data is processed by our Technical Directors and then put to use, thereby enhancing the utility. Our Publication namely AMARJIT TRADE SERIES is available in book form as well as on Internet. All other publications are available only in book form.